Truly radiant in its exquisite color shifting quality, the RAINBOW ELEGANCE handmade necklace is a mesmerizing piece of jewelry. 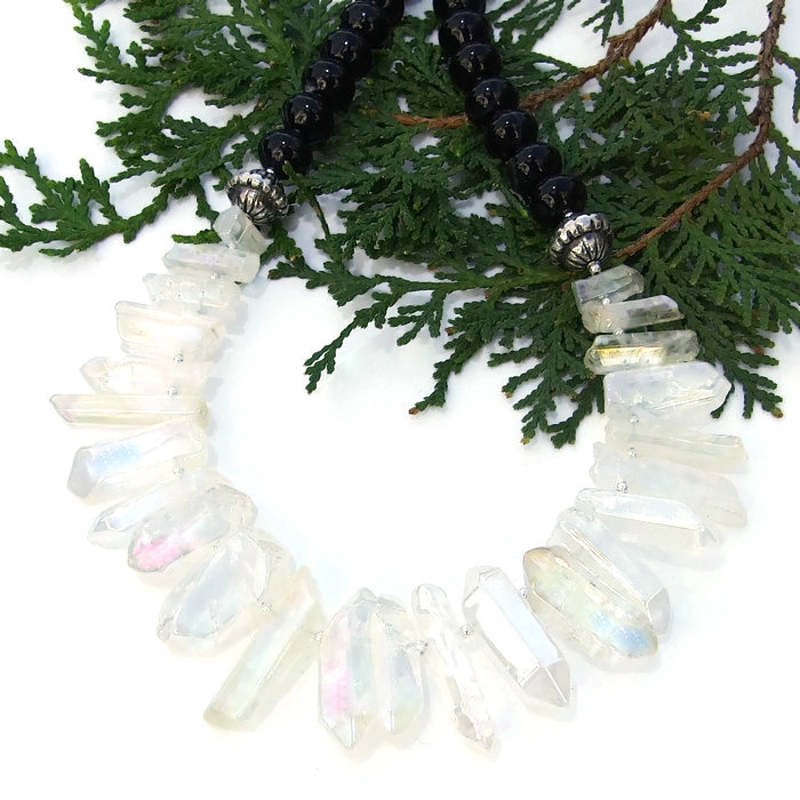 Created in a trendy bib or collar style, the one of a kind necklace features clear quartz spike points with an aurora borealis rainbow finish that transforms the quartz into luminous spikes of color. 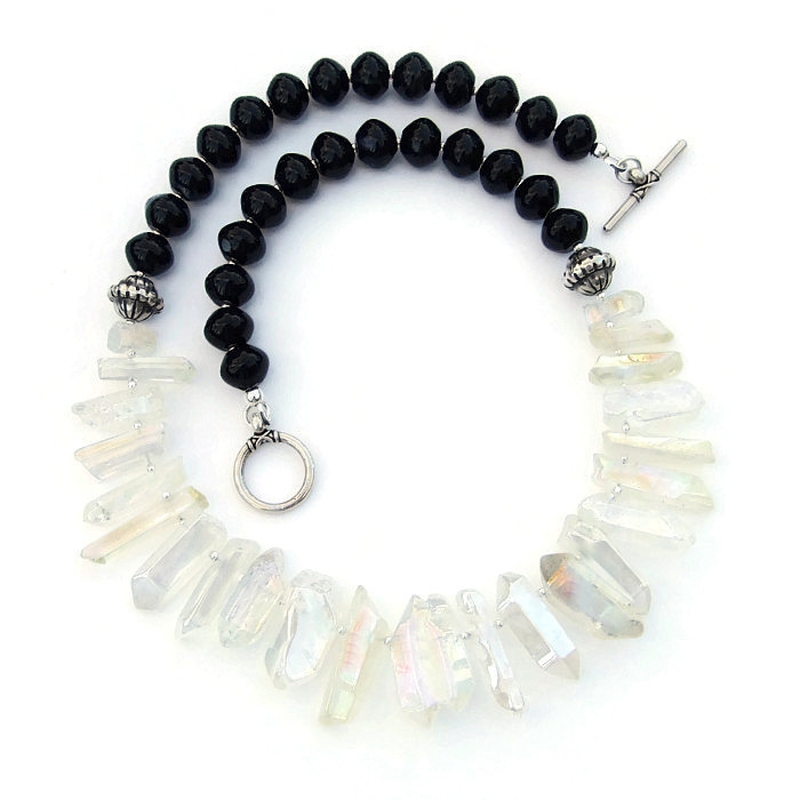 For gorgeous contrast, highly polished black agate (also called banded agate) gemstone rondelles, separated from the quartz by large sterling silver beads, finish the back of the necklace. 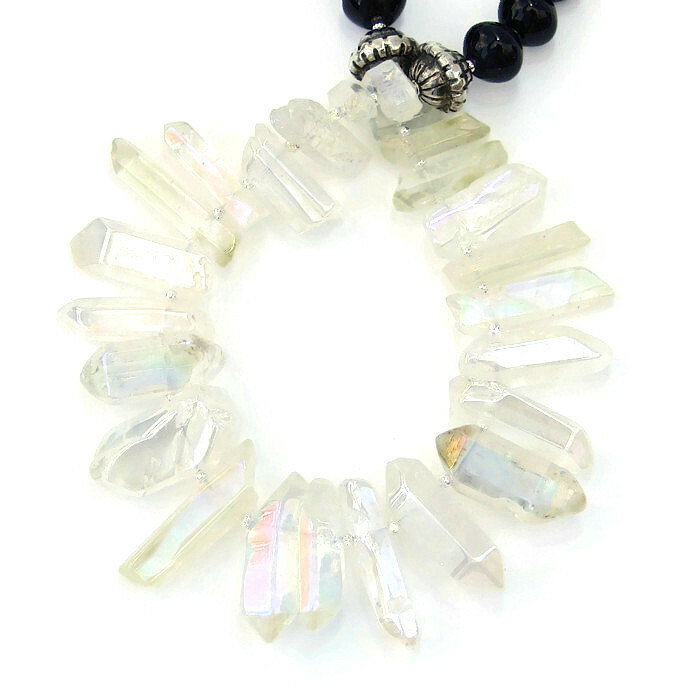 Created for the unique woman who loves stylish statement jewelry, the unique RAINBOW ELEGANCE necklace was carefully designed and handmade by Catherine of Shadow Dog Designs. 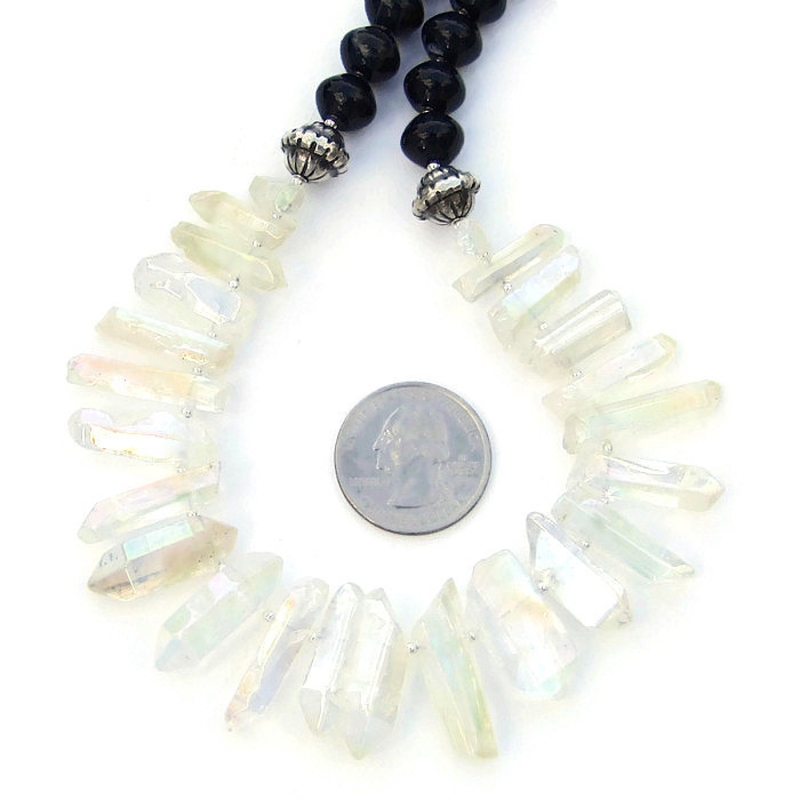 *** For a better understanding of the relative size of the rainbow quartz points, back agate and other elements used to create the RAINBOW ELEGANCE artisan necklace, please be sure to check out photo # 6 for a size comparison with a quarter. I only wish the photos do the quartz points justice. It’s hard to take good photos of clear quartz against any type of background. Photo # 3, the necklace hanging on a jewelry bust, gives the best indication, although you don’t get the full range of colors. As was mentioned above, the quartz spikes were coated with an aurora borealis finish that causes a color shift depending on the angle of the light. The colors range in each and every spike from shades of pink, blue, turquoise, purple, yellow, gold and silver, many colors often showing up on a single point. When the necklace is worn, the colors change each and every time there is movement. The center spike is a double point, something you don’t see often. The rest of the spikes are singles and are graduated in size, the largest in front with the smallest at the back. Small sterling silver beads separate each spike so that they hang gracefully when the necklace is worn. 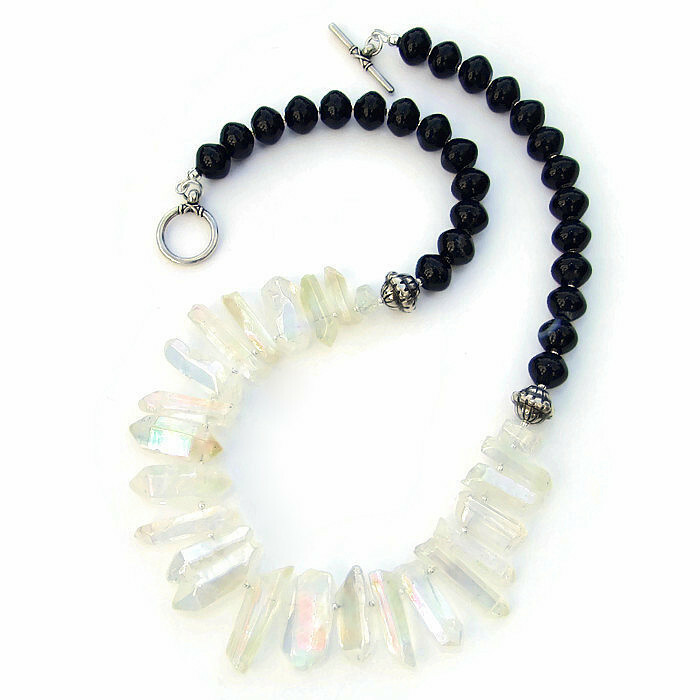 Separate the rainbow quartz from the black agate are two large sterling silver beads. These are called fancy beads because of their lovely detailing. A raised ridge of elongated dots run along the equator of the beads. The top and bottom of the sterling beads are etched with lines. The silver beads were given a dark patina and then polished, highlighting the lovely details. The back of the RAINBOW ELEGANCE necklace is finished with glossy black agate rondelles. Even though the name of the gemstones has “black’ in it, some of the stones have natural white lines, spots and blotches that black agate is famous for. Two even have “eyes” that are very sought after since they are supposed to ward off the evil eye or curses. You can see one of them in photo #3. 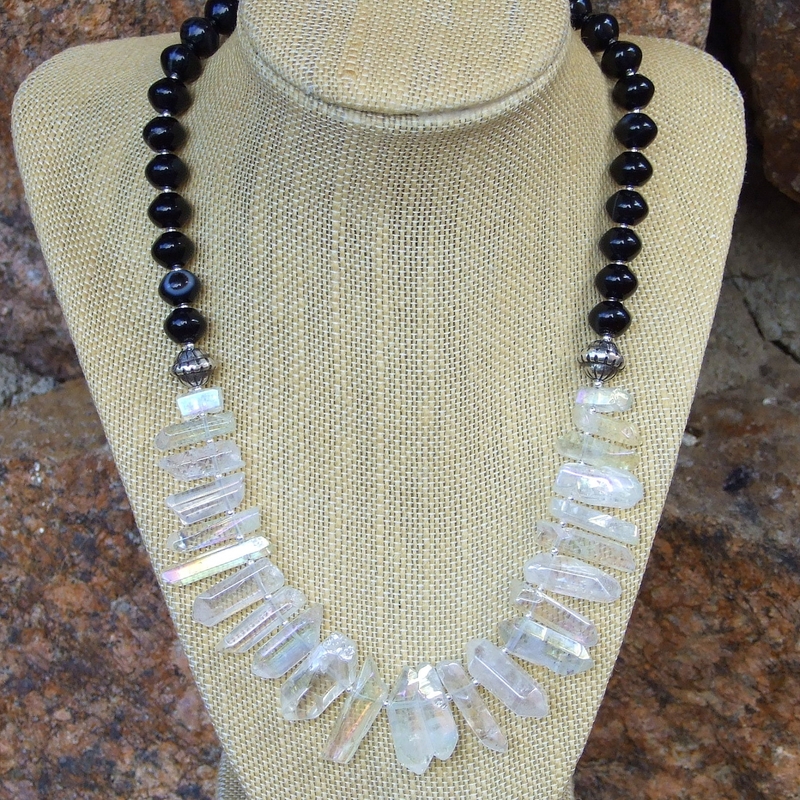 Each piece of black agate is separated by a small sterling silver bead. The artisan necklace is finished with a lovely sterling silver toggle clasp with a cross cross design. 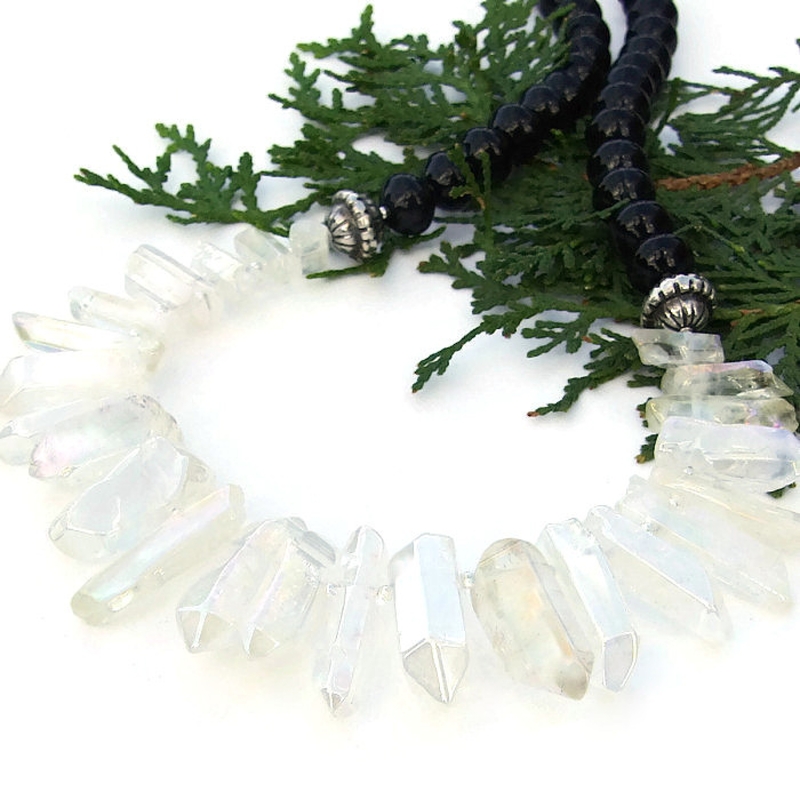 Quartz is said to cleanse the mind and body by removing negative impulses; it is believed to be a “Stone of Power,” able to bring the energy of the stars into the soul. Black Agate (banded agate) is regarded as a bringer of health, prosperity and security; “eye” agates are believed to ward off the evil eye or curses. Silver is a metal of love and healing; it is a mirror to the soul, helping us to see ourselves as others see us. 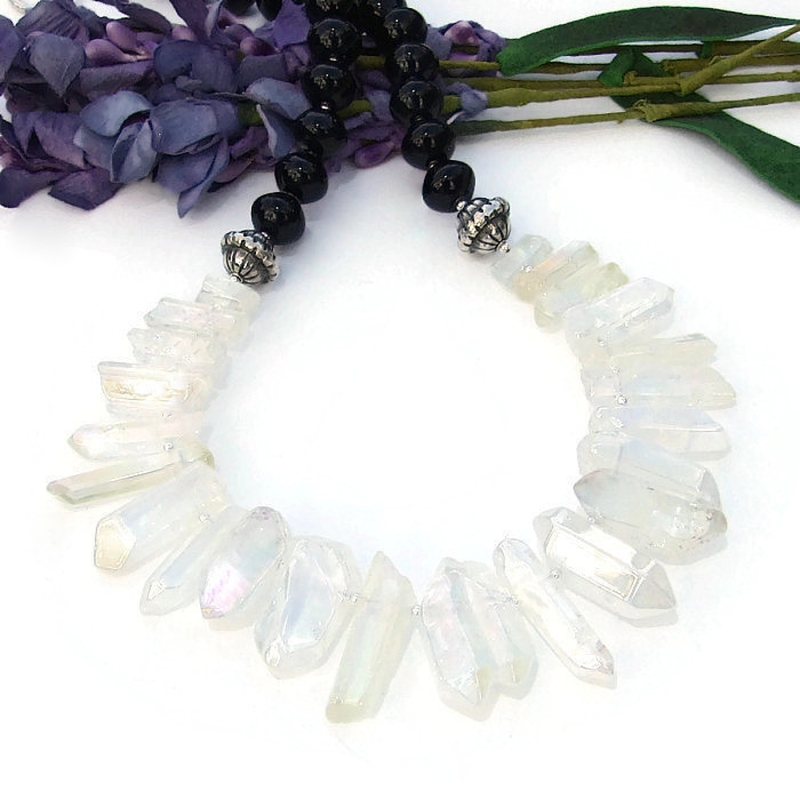 The RAINBOW ELEGANCE artisan necklace was carefully designed and handmade in a dog friendly, smoke free studio. The necklace will come with two informational drop tags: one with the piece's name; the other lists the materials used in the necklace and the language of the stones and metals. It will be carefully packed in an organza jewelry bag, perfect for gift giving to a loved one . . . or to yourself!